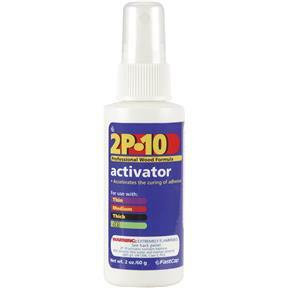 FastCap 2P-10 ACT 2.25OZ - 2P-10 Activator, 2 oz. Due to DOT shipping restrictions this item cannot ship via air services, or to addresses outside the Continental United States.With 2P-10 you can easily glue the hardest joints in cabinetry without clamping! 2 oz Activator. With 2P-10 you can easily glue the hardest joints in cabinetry without clamping! 2 oz Activator.